Feeding centre run by MSF (Medecins Sans Frontieres). Flow Awid is given the body of her dead daughter Jullet, who died the previous night. Now Flow will tie Jullet on her back and return home by cyclo taxi. It will take at least four hours to get back to her village. Esther Acuma ties her dead 10 month old son to her back. He died the previous night of severe malnutrition. She is carrying his body back to her village by cycle taxi, a journey that will take 4 hours. 63 year old Julius Peter Dul in Aloi camp for internally displaced people (IDPs). He lost his wife three months ago when she was beaten to death by Lord's Resistance Army (LRA) rebels when she was out working in the fields. Julius, who suffers from the effects of polio, fled from his village taking only his crutches and his two year old grandson Albert. Esther Acuma has tied her dead 10 month old son to her back. He died the previous night of severe malnutrition. She is carrying his body back to her village by cycle taxi, a journey that will take 4 hours. 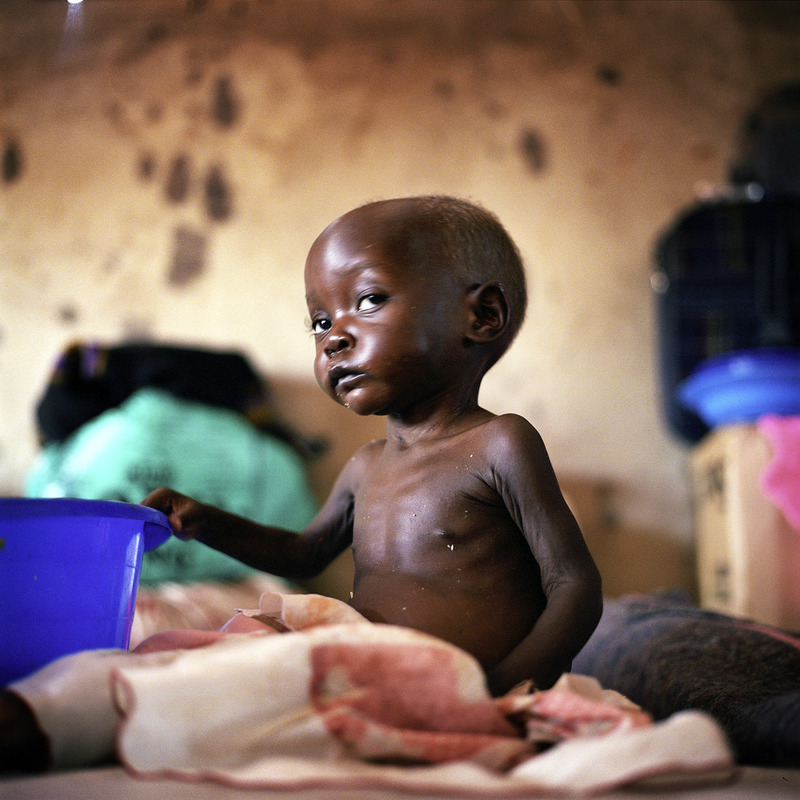 Collin Abura, 21 months old, was admitted to the Lira therapeutic feeding centre, run by MSF (Medecins sans Frontieres), suffering from severe malnourishment. The grave of a 15 year old boy who died of cholera at a roadside. 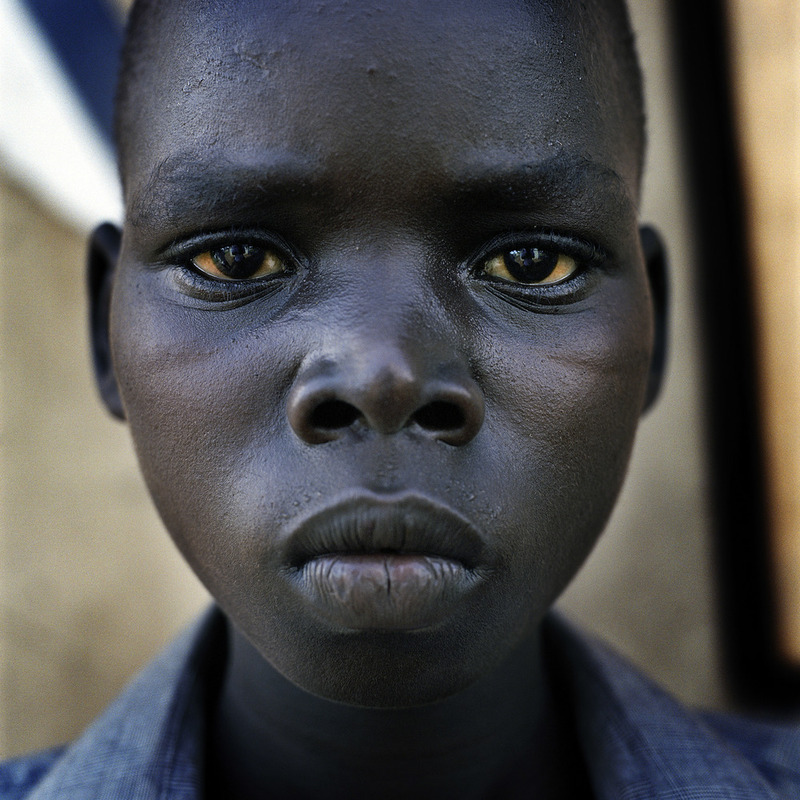 Francis Tabu (14) was abducted and held for 2 years by Lord's Resistance Army (LRA) rebels. He managed to escape when their hideout was destroyed by the UPDF. Children gather together to sleep every night in the town of KItgum. Afraid of being abducted by the Lord's Resistance Army (LRA), each night up to 15,000 children leave their homes in nearby IDP camps for the relative safety of the town. In the morning they will return to their homes. Soldiers of the UPDF protect IDP (internally displaced people) camps against LRA (Lord's Resistance Army) attacks. The wind whips up a dust storm in Kitgum. 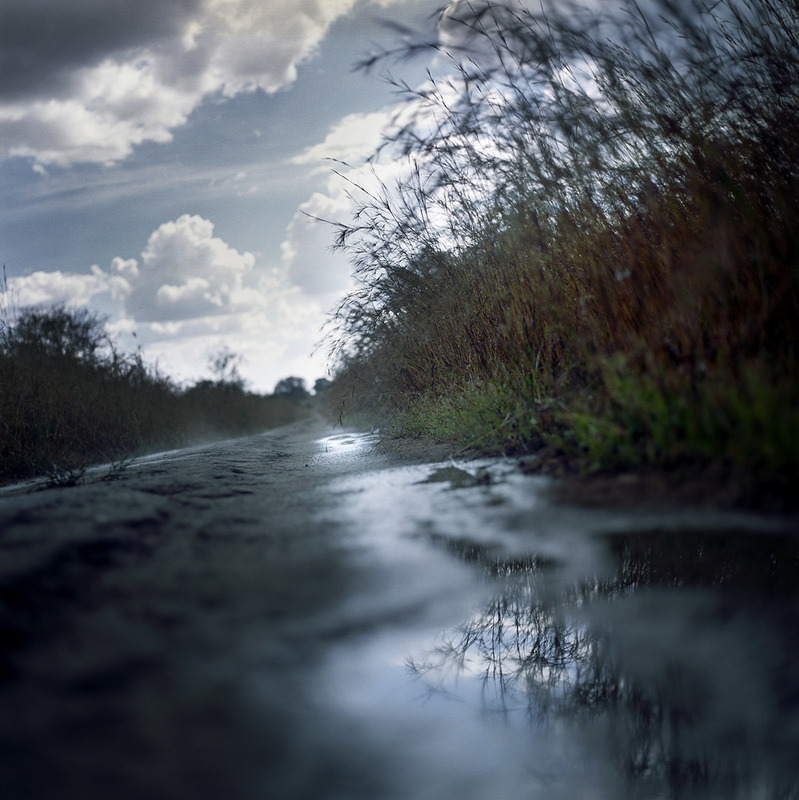 Muddy road leading to Akilok camp. The roads are extremely dangerous. LRA (Lord's Resistance Army) fighters abduct and ambush people along these roads using the elephant grass that borders them as cover. Evelyn Akite, aged 18 months, is severely malnourished but is getting better due to treatment at the Lira therapeutic feeding centre, run by MSF (Medecins Sans Frontieres). Jacinto Odot (52) is a father of eight. Two of his children were abducted and died while fighting for the Lord's Resistance Army (LRA). Agweng camp for internally displaced people (IDPs). Angelina Ajem (45) collapses suffering from severe dehydration and tuberculosis (TB). Feeding centre set up by MSF (Medecins Sans Frontieres) for internally displaced people (IDPs). Aerial view of Acholibur camp for internally displaced people (IDPs). 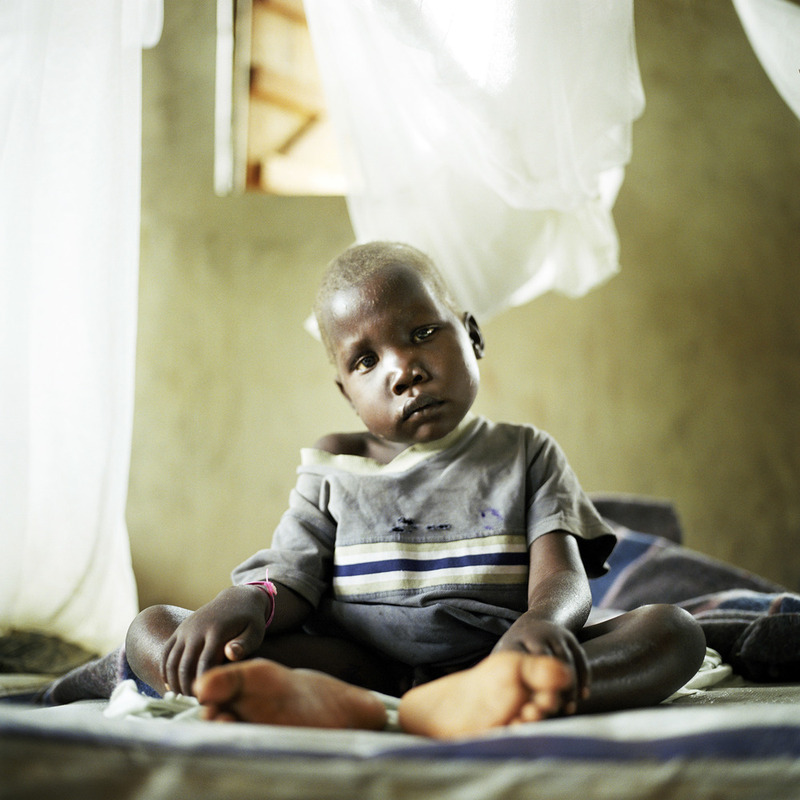 David Otim suffers from malaria and tuberculosis (TB). He became ill after he was abducted by the Lord's Resistance Army (LRA). He later managed to escape and fled to Agweng camp with his family and a bicycle. The bike is the only thing he has left from his old life. He used to be a farmer. Now he depends on the goodwill of his neighbours in the camp for internally displaced people (IDPs) because he is not yet eligible for distributed food handouts. 14 year old Erin Akullu holds the only thing she and her family were able to take when fleeing from the Lord's Resistance Army (LRA). Around 35,000 people live in miserable conditions in this camp for internally displaced people (IDPs). 10 year old Evelyn Akanjo in Orum camp for internally displaced people (IDPs). She holds her school bag, made for her by her grandfather, which is all she has left after fleeing her village to escape from the Lord's Resistance Army (LRA). Foibe Akelo holds the radio she took with her when she fled from the LRA (Lord's Resistance Army). 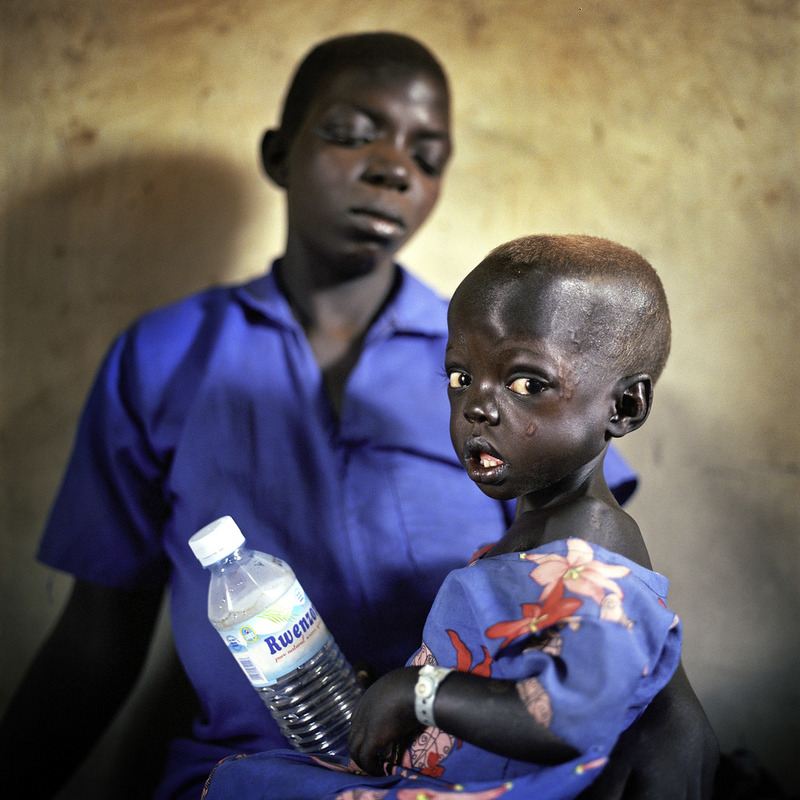 Flow Awid sits next to her severely ill daughter Jullet who died later that night in this feeding centre run by Medecins Sans Frontieres (MSF). Karen Aweno (48) has tuberculosis (TB). She is a resident of the Agweng camp for internally displaced people (IDPs). Father and son in Awere camp for internally displaced people (IDPs), wearing rags. Around 2,400 people live in this remote camp for internally displaced people (IDPs). Several people had died during the previous few days due to an outbreak of cholera. Therapeutic feeding centre for IDPs (internally displaced people) in Lira set up by MSF (Medecins Sans Frontieres). Carers of children under five pass the time knitting wool provided by MSF. A woman carrying wood to her home. The elephant grass offers cover to LRA (Lord's Resistance Army) fighters who often attack the local population. A young boy crouching on a set of scales waiting to be weighed in an MSF (Medecins sans Frontieres) feeding centre for IDPs (internally displaced people). Mothers waiting for medical check ups for their children at a therapeutic feeding centre set up by Medecins Sans Frontieres (MSF) for internally displaced people (IDPs). Malnourished children in an IDP (internally displaced people) camp in Northern Uganda. Therapeutic feeding centre run by MSF (Medecins Sans Frontieres). 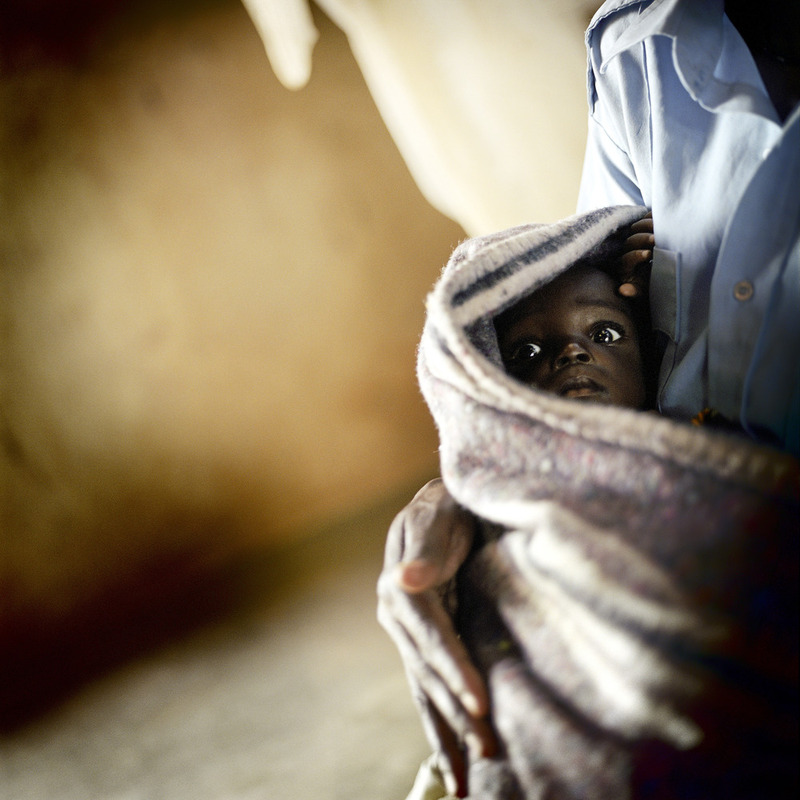 Sandra Abeja is a malnourished orphan brought to the centre by her grandfather after her parents were killed by the LRA (Lord's Resistance Army). Wiliam Otoa (10) holding his 2 year old brother Innocent in the feeding centre run by MSF (Medecins Sans Frontieres). They are orphans. Wiliam is a former LRA (Lord's Resistance Army) abductee. He was forced by the LRA to kill two of his best friends. After 2 years he was left nearly dying of exhaustion. He managed to return to Agweng camp where he found his family again. Less than 3 months later the LRA attacked and brutally murdered his parents who were working in the fields close to Agweng. William is severely traumatized by these events and has been transferred to a special programme for former child soldiers. His young brother is looked after by a relative. Children gather together to sleep every night in the town of KItgum. Afraid of being abducted by the Lord's Resistance Army (LRA), each night up to 15,000 children leave their homes in nearby IDP camps for the relative safety of the town. In the morning they will return to their homes. For 18 years the LRA rebels have terrorised the Northern provinces of Uganda abducting 20,000 children and forcing 1.6 million people to flee their homes. According to Medecins Sans Frontieres (MSF) the mortality rate among children in some areas is five times the rate internationally agreed to constitute an 'emergency out of control'. The UN's under-secretary general for humanitarian affairs has called Northern Uganda the "largest neglected humanitarian emergency in the world". Boys playing with toy guns made of grass. Many children of their age have been forced to fight for real after being abducted by the Lord's Resistance Army (LRA). Feeding centre run by MSF (Medecins Sans Frontieres). Ronald Okwir's parents were killed by the LRA (Lord's Resistance Army). He was brought to the feeding centre suffering from oedema by a woman who found him in a camp near Apac. Old woman praying for peace in Oromo internally displaced people camp (IDP). The Lord's Resistance Army, which claims to be fighting for a state ruled according to the Ten Commandments, has terrorised the northern provinces of Uganda since 1987, abducting 20,000 children and forcing 1.6 million people to flee their homes. According to Medecins Sans Frontieres the mortality rate among children in some areas is five times the rate internationally agreed to constitute an 'emergency out of control'. The UN's under-secretary general for humanitarian affairs has called Northern Uganda the 'largest neglected humanitarian emergency in the world'.